Tom Lucas lost his commercial building on Conant, which also included his residence on the upper floor, in the tornado of 1997. Did you enjoy your Fourth of July holiday this week? 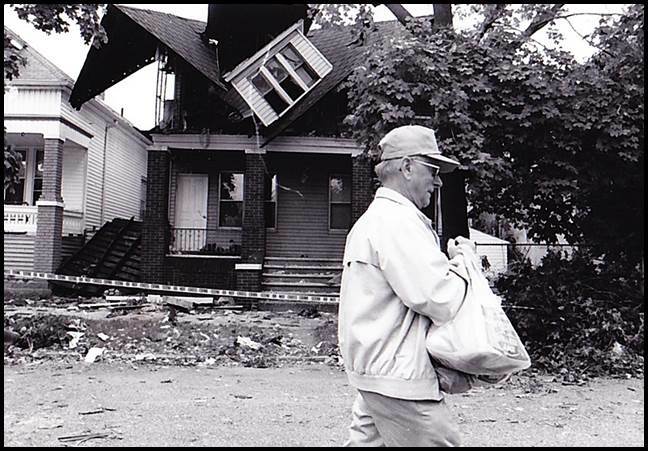 A lot of folks didn’t have a happy Fourth 21 years ago when a fierce tornado swept through town on July 2 at 6:15 p.m. The city shut down for a few days while work crews cleared debris throughout the city. Most folks did not have power during that period, and there was a strictly enforced 10 p.m. curfew at night – meaning you couldn’t walk around town and hit the bars. It didn’t matter anyway because most of the bars were also without power. It was a bummer, for sure. Whether it was a tornado or just a fierce windstorm is still up for debate. The National Weather Bureau said there was at least one tornado that swept through the Detroit area. Some insisted it was a “straight line” wind – despite the fact that not many knew exactly what that is. The winds were clocked at 185 miles per hour. Typically, people who experience tornados describe the sound as being like a train locomotive speeding through. Not so for a Grand Haven resident. “It was so powerful, it was quiet. It broke the sound barrier,” the resident said in an article in the former Citizen newspaper. One thing that wasn’t up for debate: The storm caused widespread destruction in a matter of minutes. On that fateful Wednesday evening, the sky turned a yellow-green and then the storm ripped violently throughout the city, up Caniff, partly down Jos. Campau, over to Conant and twisting into some of the neighborhoods. Several buildings were destroyed, and it was estimated that 500 huge trees came crashing down. Tom Lucas lost his commercial building, which included his living space upstairs, on Conant. 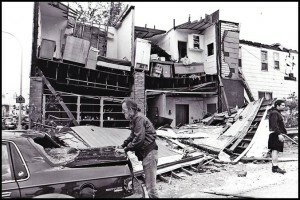 A photo of him outside his building, which was split in half, was published on the front page of The Citizen newspaper. “It looks like a bomb went off,” Lucas was quoted in the paper about the damage to his building. It was estimated the damages totaled $25-$30 million just here in Hamtramck. 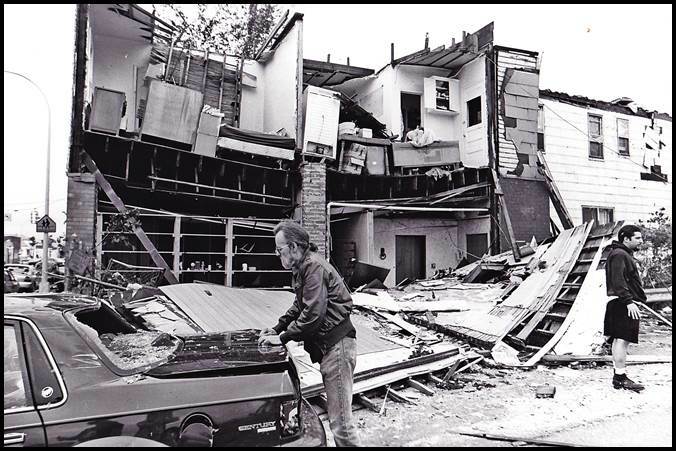 Then-President Bill Clinton declared the Detroit area an official disaster area and funneled federal dollars to help with rebuilding the city. Homeowners were also offered low-interest loans to make repairs, but many later complained of being choked by bureaucratic red tape and gave up in frustration. Many houses throughout the city were damaged by the storm. Wayne County Executive Ed McNamara also offered assistance, and noted that this was an opportunity to make needed updates to the city. Crews worked around the clock to clear out the giant trees. The sound of chainsaws could be heard late into the night. The city and volunteers stepped up and began to aggressively replace the lost trees, but the look of Hamtramck streets was forever changed. There were no serious injuries, although a resident died of a heart attack cleaning up his yard. Elsewhere in the Detroit area about a dozen people died from the storm. The storm rampaged through the east side, striking the Grosse Pointes as well. Immediately after the tornado struck on Jos. Campau, looting began. State police and the county sheriffs were called to keep order. Two people were arrested for looting. The Police Department at that time did not have a back-up generator to provide electric service, so the county pitched in and installed a portable one. In the meantime, residents near the old police station brought in soup and sandwiches for the beleaguered police staff. While there was a curfew, residents living around Pulaski Park continued on with a tradition of setting off fireworks in the park. Although fireworks were illegal at the time, the Police Department never enforced the law on July 4th. On the political side of things, the storm presaged a sweeping change in city hall. Former City Councilmember Gary Zych was challenging longtime Mayor Robert Kozaren in what turned out to be a contentious election year. Zych ran his campaign largely on Kozaren’s handling of the tornado crisis. Zych zeroed in on the city’s lack of emergency planning. Zych ended up beating Kozaren later in November by just a handful of votes. That political tornado turned out to be just as damaging – in some ways – as the real deal.